In less than a month I will be on my way to South Africa for a brief holiday. What I look forward to the most is catching up with family and friends. Even though I have been living in Ireland for almost 13 years now, I find that time simply melts away and we are nattering away. like it was only yesterday that we saw each other last. I do value my friends and work hard to keep contact. Distance and the pressures of daily life sometimes get in the way. I am grateful to be in contact with friends that I have had since I was five! I have moved around a lot in the last 15 years. The big move from South Africa, the move to Westport and now the move back to Galway. At every stage of my life I have made new friends. I don’t always have time to talk every day, but I do value my friends. 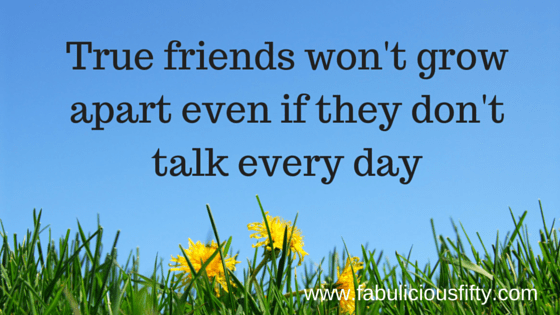 Today’s quote simply says, true friends won’t grow apart if they don’t talk every day. I am so glad about that. I love good party and am looking foward to my housewarming party on Sunday – another great excuse to catch up with friends old and new.